Hug Your Way to Better Health • Run Hard. Rest Well. Hugs … We all love them. At least most of us do, and here is why you should consider doubling up your efforts on hugging. Hugging releases oxytocin, a chemical that has been linked to happiness and social bonding. According to research at DePauw University, oxytocin promotes the feelings of trust and devotion. The catch is the longer, the better. 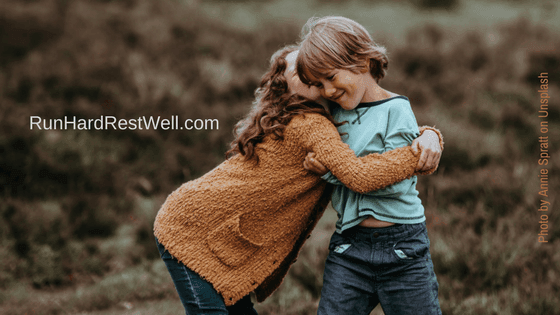 In order to fully release the oxytocin in your body and the person you are hugging, it needs to be at least 6 seconds, although a super-long 20-second hug will maximize this. Hugging your loved ones just a bit longer will strengthen your bond to each other. Believe it or not, hugging can actually reduce your blood pressure. Activating pressure receptors in your body, they send signals to the part of your brain responsible for lowering your blood pressure. Dang, bet Quaker Oatmeal didn’t see that one coming. Instead of eating this horrible hot breakfast, you can just cook some eggs instead and offer up some hugs in the morning. Romantic hugs keep the heart strong, literally! In 2009, a study by the American Psychosomatic Society revealed that partners who engaged in hand holding and a 20-second hug before speaking about a stressful situation had a lower heart rate and lower blood pressure than participants who were left alone to rest quietly without their partners before speaking. -Blood pressure soared in the no-contact people. Their systolic reading jumped 24 points, more than double the rise for the huggers, and their diastolic also rose significantly higher. -The non-huggers also saw their heart rate increase 10 beats a minute, compared to the huggers, who only saw an increase of 5 beats while discussing a stressful situation. It reduces stress. In other studies on touch, researchers have found that the human touch lowers output of cortisol, a stress hormone. But it goes even further, because not only does the human touch reduce stress levels, but it also increases serotonin and dopamine, two brain chemicals that make you feel good. Forgetting about all the scientific studies, hugging feels good. Squeezing your children, wrapping your arms around your spouse, or welcoming a friend into your life, the act itself is very rewarding . . .
Who are you going to hug today?! Remember: a 6-20 second hug does wonders! I’m told this also works with animals. Maybe that’s what keeps me going. Shadow does like to sleep on my head. LOL. The question is … do you sleep better with Shadow on your head! LOL! No! Thankfully he doesn’t spend the whole night there. Give Shadow a little hug from me.